Life is just a busy blur at the moment and blogging is sporadic at best (non-existent at worse). However, I just finished reading Learning Contentment, by Nancy Wilson and there were three quotes which I wanted to mark down in order to reflect upon and to remember. This might not be such a "polished" review as it is a memory bank at the moment. That'll do for the present. "Contentment is internal. It is humble. Contentment is submissive to God and thanks Him for all things. Contentment chooses not to fret or fuss or moan or complain and views such things as threats and enemies. This doesn't mean that we quit praying . . . . It means that we are content while we pray. We are satisfied with what God is doing in our lives through the hard circumstances." Being human and possessing a short-sighted view of the history of the universe, it is quite hard not to fret, fuss or moan when I don't believe that things are 'going my way.' Viewing the fretting, etc., as an enemy puts a new spin on those behaviors and challenges me to be more on guard. It's much easier to think that God makes mistakes than it is to accept the fact that I have limitations and can only see fragments of a large puzzle. "A godly grief glorifies God. This means we must think about how to grieve in a God-honoring way and keep our hearts from being "troubled." A godly grief does not turn inward. It continues to look up to God and out to its neighbors. Duties are still required in both areas. our grieving must be Christian. It is vastly different from the grief of those who are without hope and without God in the world (Eph. 2:12). Our grief must evidence our belief in God Almighty. Maker of heaven and earth. It must be kind. Pain comes to all and to each their own. We cannot escape life without having a set of afflictions. The only thing that varies and is questionable is what type of grief you'll be visited with. But rest assured, trials are coming (if they aren't here already). It's so remarkably easy to curl up into a tight fisted little ball and say to those who try to approach us, "You don't understand. You've NO grace for me!" Lately I've come to see that that response is anti-grace. It demands grace without extending it. It is hard to reach a person's heart when they are hollering at you that your words are wrong and your actions are pathetic. A grieving person is a grace-eating machine but with few exceptions seldom recognize that they are not extending it themselves. I include myself in that accusation! When I read this passage by Wilson I thought, "YES! THIS! This explains how it's supposed to look." We each of us have duties in grief which include working at keeping our heart from being troubled, asking God to reveal His will and direction for our lives, and loving those who approach us with a desire to speak peace. One of these duties does include accepting another's attempts to love, even when they seem childish in their offerings. Godly grief is easier to accomplish in a state of contentment, sure. 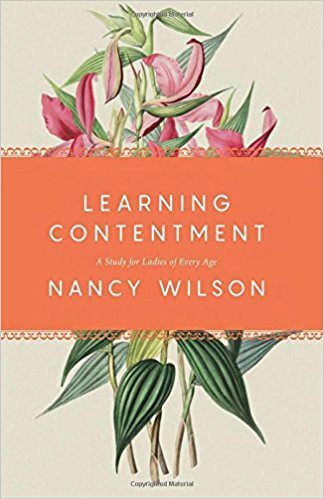 So I see the importance of 'learning contentment' because grief is a sure thing. "Most families with broken relationships are caught up in petty fights over things that were no more important than being late to the dentist. It is here in the daily bumps and provocations that our enemy disturbs our peace and makes war against the unity and fellowship we should enjoy. I think this world is full of a spirit of discontentment. Going against that flow and following hard after Christ is a challenge for each and every Christian -- to stand against the tide, go against the grain, and declare that we'll choose something better and something greater. Contentment doesn't come easy but the good things never do. Will any of us ever be perfectly content on this earth? Not likely. But should it be our aim and should we put the work and the effort into striving towards it all the same? I say yes. Do the hard thing. Always good to see something from you pop up in my feed! The hardest problem I have with contentment (besides a fleshly nature that grouses when things don't go the way I think they should) is not equating it with passivity. Thinking of people like Wilberforce fighting against slavery - contentment (which I also seem to tie in with resting in God's sovereignty) didn't mean not taking action. Good thoughts about contentment and grace in grief. There are SO many posts and articles about what not to say to people in different situations, and while they can be helpful, they often show no grace to the person who means well but inadvertently says the "wrong" thing. I think I'll be looking for this book...very soon.